Rebranding is an increasing trend among law firms — but what does that mean? For many law firms, it means slimming down the firm name, designing a new logo and applying a different color palette. The firms probably worked with a design agency to create the new logo — but one wonders how much, if any, of the process was guided by input from clients. While many law firms pay little (or no) attention to what their brand is, or to managing it, make no mistake: They still have a brand, and it is being identified and managed by the marketplace: the firm’s clients and — unfortunately — the firm’s competitors. Certainly a brand goes well beyond a logo. In fact, it encompasses everything that a law firm wants to be in the minds of current and prospective clients. In our brand analysis, development and management projects with law firms, we at Jaffe work with six primary aspects of brand identity and brand management. 1. Brand Promise — a short statement that tells clients and prospective clients what they can expect when working with a firm. It is not a logo or a tagline. Rather, it is a timeless, permanent statement about the value the firm provides to clients. The promise must accurately reflect the realities of what clients actually experience when working with the firm. Otherwise, it is simply an aspirational statement and does nothing to promote or solidify the firm’s reputation in the marketplace. 2. Brand Values — the firm’s non-negotiable core beliefs. These values influence everything from whom a firm hires to how it provides legal services. Values are the soul of a company and should drive all that you do. Values also guide a business culture, which is the habitual collective act of individuals shaping the firm through their principles and day-to-day actions. 3. 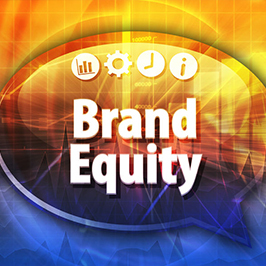 Brand Equity — the value associated with a law firm in the marketplace. Brand equity is how clients think, feel and act with the brand. Client loyalty is a measurement of brand equity, and that loyalty increases attraction and awareness to the firm and its culture, knowledge and proven track record. 4. Brand Story — communicates critical information about the firm, its attorneys and service offerings in a compelling way that speaks directly to clients and audiences. This is important because clients and prospective clients are inundated with options for legal services and often say that it is difficult to determine what makes a firm stand out from its competitors. The brand story must be authentic, and it should strive to connect on an emotional level more so than a résumé. 5. Visual Brand — the visual elements that give the firm’s brand a unique identity in a crowded and highly competitive market. This is where the elements of logo, typography and color palette come into play, along with the style of promotional and educational materials, such as proposals, attorney profiles, websites, advertisements and leave-behind pieces. 6. Brand Strategy — the process of building and managing a brand, driven by strategic, consistent deployment of the components in alignment with the brand identity. Authentic branding is the alignment of what a firm says (external) with what it does (internal). A brand strategy is a series of tactics and actions that continue to articulate and promote brand strengths, differentiations and promises externally, while continuing to listen and change to stay in line with clients and the marketplace. Great brand strategy revolves around clearly and honestly articulating what makes your firm different from your primary competitors and the many other firms in the market. For example, many law firms say that quality work, depth of experience and/or client service is the differentiator. While that may be true, for a brand identity centered around these values to have integrity in the marketplace, the firm’s clients must agree that these are, in fact, the top qualities that make the firm different from other firms with which they have worked. Firms looking to create/refine and manage a strong brand strategy should first assess their current brand perception. Jaffe uses a Brand Strategic Framework (BSF) to guide our work in this area. The purpose of the BSF exercise is to identify a firm’s current brand characteristics, culture and value to clients, and assess how to capitalize on these differentiators and brand attributes. The result of the BSF is a set of recommendations that, if implemented and managed strategically and correctly, will increase accurate brand recognition and brand equity for the firm. Brand recognition and brand equity are important determinants of a law firm’s competiveness. As with any marketing or business development initiative, there will be challenges that must be overcome for a brand assessment and strategy management initiative to be successful. Too internally focused. While it is necessary to understand how the firm’s attorneys and staff see and communicate the brand message, a brand analysis in which the number of internal members interviewed outnumbers those with an external perspective dramatically skews the analysis. It is the external brand perspective that law firms typically do not know, and the only way to understand (and correct, if necessary) what the marketplace says about your brand is to ask. Misunderstanding the external role. Law firms often hesitate to ask clients or other external sources for feedback, fearing negative comments. In the case of a brand analysis, it should be understood and communicated, both internally and externally, that the purpose of a client interview is not to seek feedback about areas where the client feels the firm could improve. Instead, the focus of the external conversations is to understand how clients describe the firm to others in the marketplace. Disregarding findings. If enough clients are interviewed, a firm’s brand position in the marketplace will become evident; however, law firms may disagree with the uncovered position. Alternatively, if there is agreement, they may tend to rest on their laurels. Neither of these will result in a strong brand reputation for very long. Firms that want to remain competitive in the global, fast-paced and ever-changing legal market landscape need to pay close attention to their brand strategy and management program. Establishing and managing an accurate brand requires an ongoing commitment to monitoring your brand regularly and having a plan for correction when there is any indication of inaccurate brand message in the marketplace. What is your firm’s brand identity? What do your clients say it is? As law firms enter the budgeting season, it is time to answer these questions or find out whether the answers are contradictory. If either is the case, it is likely that parts of your marketing budget will be allocated inappropriately. If you would like to discuss how your firm can start the critical process of brand management, contact Terry M. Isner at tisner@jaffepr.com.